Mick Dundee would be proud. I am fully obsessed with World, but my limited time with Monster Hunter 4 Ultimate on 3DS hadn’t really prepared me to make an informed decision about which weapon to use. I decided to ask my more Monster Hunter-literate colleagues Keza MacDonald, Heather Alexandra, and Paul Tamayo to weigh in. Kirk Hamilton: Hello, fellow monster hunters. I’ve been playing this game nonstop since it came out on Friday, and I know you’ve all been playing, too. I want to ask everyone about weapons, since picking a weapon has definitely been the most intimidating choice I’ve had to consider so far. What have you all been using? Paul Tamayo: I’m using a Charge Blade. I’ve used the Switch Axe in previous Monster Hunter games, so I’m trying something new! Heather Alexandra: I’ve been a proud Dual Blades gal for a few games now and can’t find it in my heart to switch to anything else. They’re perfect! Keza MacDonald: I use the mighty morphin’ Switch Axe, which makes me feel like a prehistoric Transformer; the Gunlance, my faithful main weapon for many years; and the glaive, because I really like spinning around like a Jedi and landing on monsters’ flanks. This time around, I want to finally learn the bagpipe, as the Hunting Horn is affectionately known in my players’ squad. Kirk: Nice. Such variety! I started out with a Long Sword and liked it quite a bit, then tried Dual Blades on Heather’s recommendation. Liked those too. Then I decided to try the Charge Blade on a whim, and I had to Google how the heck it worked because it’s so much more complicated. But now that I know how it works, I think I love it? Seems like it’ll be really fun to master. 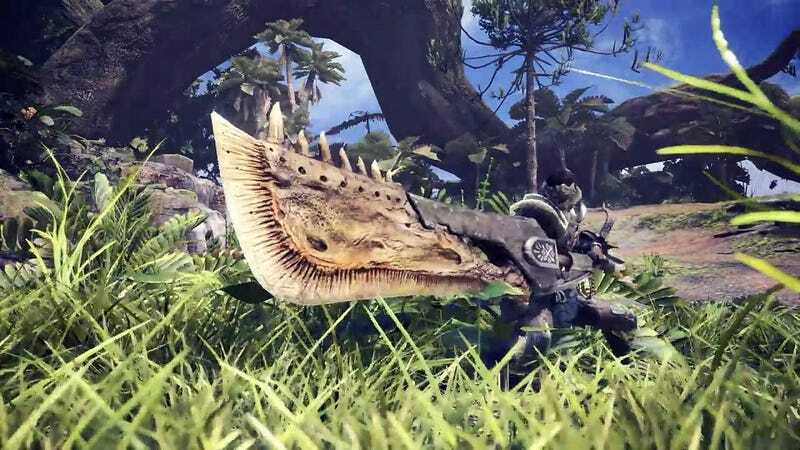 I’m curious, given how you all have played this series more than I have: what do you all look for in a MH weapon? Keza, you mentioned the Gunlance, which is at least partly a ranged weapon—do the rest of you ever consider ranged weapons? Keza: The Gunlance only works up close actually; the “gun” part is an explosive burst that is only effective if you’re right up in a monster’s grill. I’ve never loved Bowgun play because I have limited patience for fiddling with ammunition types. Monster Hunter: World does make that much easier than before, though. Kirk: Yeah, I feel totally overwhelmed by ammo types and thankful that I don’t have to worry about any of that. Keza: For me, I need one weapon that hits VERY hard, and one weapon that’s faster and more mobile for the monsters that just won’t stay still. No matter what your weapon, you will find one mission that just flummoxes your combat style if you stick to just the one technique. Heather: It’s about having the right balance of mobility versus power. With ranged weapons, the Light Bowgun can be nice since you still have some mobility. I think a lot of people will want to use the Heavy Bowgun because it’s so chunky but I don’t find it practical. For me, I need to get in close. Dual Blades when ever I can, Long Sword for something heavier. They’re similar enough in mechanics that it works out. It’s about having the right balance of mobility versus power. Paul: Like Keza, I too enjoy when my weapon gets its Optimus Prime on when switching between forms. I love playing as tanks, mainly, so the Charge Blade allows me a nice mix of offense and defense. Especially when I have the monster’s attention and can easily block one big hit with my shield and get right back into the action. I also love the range that I get when the weapon is in axe mode. Nothing like delivering a perfectly-timed haymaker to an Anjanath. Kirk: I just don’t think of this game as a ranged game. It’s similar to how I don’t think about magic or ranged weapons in Dark Souls. You’re supposed to go and hit the dinosaur in the face with a huge hammer, right? Keza: That’s the fun way! Ranged weapons are much less crucial now that you have the Slinger to shoot traps and bombs with. Though bowguns are excellent support weapons—you can shoot your buds with healing or buff ammo. Kirk: Yeah, that’s a whole other thing, huh? Considering what weapon to use if you’re playing as part of a team. Keza: That’s why I want to learn the hunting horn. Horn players are the most beloved in multiplayer, because their weapon is a hammer that plays tunes to buff the rest of the team. It is also BY FAR the funniest weapon. Kirk: Is it a good idea to upgrade multiple weapons? It seems easy enough to upgrade my bone stuff here in the early goings, but it already feels like I’m about to have to commit to one or maaaaybe two weapon types once I start crafting out of rarer parts. It’s making me anxious. Keza: Don’t worry, Kirk. All your hard-won monster parts will become immediately worthless once you hit High Rank. Use ‘em up! Kirk: I keep sweating that I won’t have enough parts to make multiple weapons. So that’s good to know! Heather: It’s always good to have a small smattering of options. That’s doubly true if you want to play with friends. Having the ability to flex and fill out some roles is nice for higher-tier hunts. Paul: Especially with elemental weapons to target certain monsters weaknesses. Keza: Have you guys met Odogaron yet? Paul: I don’t think so. Keza: Put it this way, you’re getting nowhere with a Gunlance on that guy. Kirk: Ha. I can’t wait. I have a feeling that many of you will have your own weapon preferences, so I hope you’ll share your own thoughts and tips in the comments. I’ll be over here getting better nailing Charge Blade combos under pressure.